It is a delight to see the response of guests as they open the gate to the 33 foot long arbor. It is partially hidden by a large lilac and juniper tree. A few years ago this narrow full sun side yard was hot and dry. 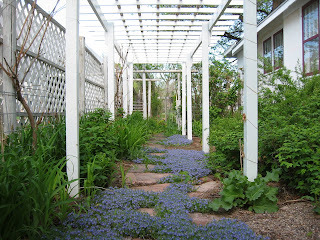 It was while visiting the Denver Botanic Gardens that I got the idea of putting an arbor that would run along the side yard that leads to the back garden. And, of course, Ted designed and made this arbor. I promised him that it would be the last arbor I would think up and so far so good. I still have 2 more arbors that I have not introduced in this blog, so indeed enough is enough. But, this arbor is a delight. I don’t think I want vines to cover it. It is fun to be able to look down and through it from from our upstairs bedroom. Gloria, what a clever use of space. 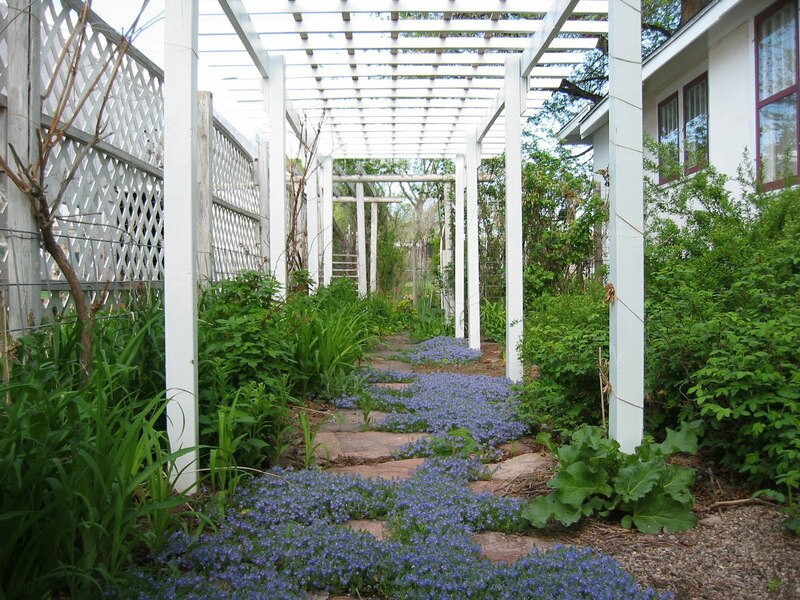 Most people do not know what to do with their side yards, they are so long and narrow. But this makes a feature out of what could be a little used space. I love the fact that it is not cluttered with vines, you can really see it. Thanks Deborah, the side yard has become a favorite. I look forward to early morning visits to the raspberries. There is an old pink moss rose that grows on the side. So fragrant and thick with petals. This is really nice and the speedwell path is awesome. It does need some climbers over the top though. Have you thought about climbing aster, what a display in the fall and butterflies will cover it. It is just a dream Gloria. That blue speedwell is fabulous. You are a great designer! It's lovely, just lovely. It doesn't need vines. In our zone 4 it is hard to find a climber that blooms and grows tall enough. I might try a morning glory. I have trumpet vines on the south side of the arbor.But they grow straight up giving a bit of shade. I also have on the opposite side of the arbor a grape and a porcelain berry vine (ampelopsis brevipendunculata 'elegans') Our area is very hot and dry, but I've added some vegetables and lots of mulch and the soil is improving. If anyone has a blooming vine that I could try let me know. With all my arbors, I have tried lots of vines. The porcelain berry vine and the grape are several years old and yet to reach the top. Thanks for all the comments, I love them! Oh, I don't knnow. To walk beneath it as flowers dangle down, and to watch bees go at them upside down or in contorted positions, that would be something, too. I love the arbor and how it reaches along the entire side of the house. The speedwell and trumpet vine play well off of each other with their contrasting colors. I look forward to seeing your remaining arbors. Gloria, This is beautiful, and so warm and welcoming; it just draws you in. This arbor says "welcome to my garden" even without a sign. Wow! What a beautiful idea! I love when people turn their side yards into something pretty like you did. Oohhh! Gorgeous but being the 'shady' character that I am, I would love to see this clothed in vines - wisteria and the like- to create a wonderfully shaded walkway, filled with mystery and allure. Of course it looks wonderful as it is. What a treasure offer unsuspecting visitors. If you ever do decide to go shady, let me know. 'Twould be a wonderful space to have a vicarious virtual garden! What a beautiful arbor Gloria! The colour of the speedwell seems to really come to life with the white arbour. I've been enjoying looking through your blog - you have such a beautiful and inspiring garden! This is a very special place - I agree with your visitors who call it a secret garden. One thing that makes a great garden is a delightful surprise. I like the lushness of your summer photos. I planted creeping veronica a couple years ago, and it has become one of my favorites. Yours is perfect with the stepping stones running through. Hi Gloria - what an arbour - its incredible. Have you ever seen a Laburnum Walk arbour before. Your carpeting plants at the base just set it off. wonderful post!